Let’s face it, when you’re out enjoying nature with your camping buddies, hot dogs cooked over a campfire can taste just as good as a dinner from a five star restaurant. That is, until you’ve gone camping with someone who has taken the time and effort to really plan out some meals for starving campers. Food is often an afterthought when planning a camping trip, and with good reason. 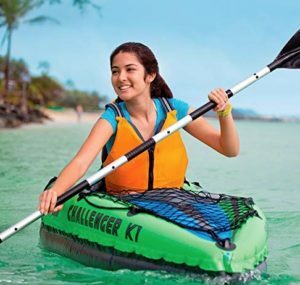 Finding the perfect campsite, planning activities like hikes and boat trips, and making a list of all the things you need to pack make your food choices a last resort. How many times have you gone shopping for food the night before your camping trip? Make ahead camping meals are really a great way to save time preparing food during your actual camping trip. You also will be able to choose some healthier options instead the usual hamburgers, hot dogs, and baked beans for three meals a day. We’ve tried many different ideas for make ahead camping meals to pack and curated a list of the top 15 meal ideas. These camping meals were vetted to make sure that they were easy to prepare, were portable enough to be able to packed, and still tasted great on the actual camping trip. For a delicious, versatile, and hearty meal to start your morning, breakfast burritos are hard to beat. You can customize them with different ingredients for different tastes, making them a great meal idea for your whole camping crew. 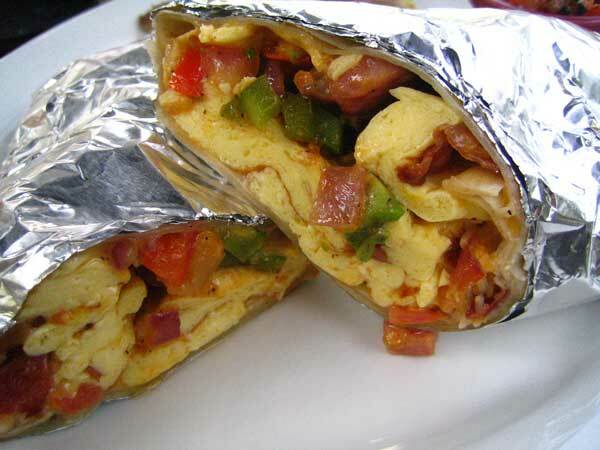 Your breakfast burrito is as simple as adding ingredients like scrambled eggs, bacon, sausage, onions, peppers, and cheese wrapped up in a tortilla. Use tin foil to wrap your burritos individually and keep cold (preferably frozen). When you are ready to cook them, you can toss your foil-wrapped burritos on the grill over the campfire or even in the crockpot. In just a few minutes, you’ll have warm, hearty breakfast burritos to start your morning. Try not to overstuff your breakfast burritos. Overstuffed tortillas leads to ripped tortillas. You don’t want your burrito to fall apart during the reheating process. 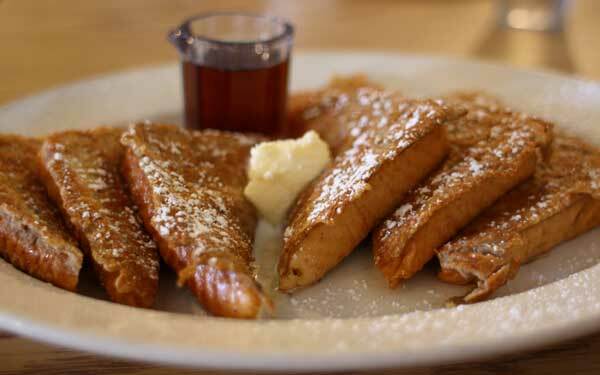 If you like to start your morning off with something sweet, french toast might be the answer. 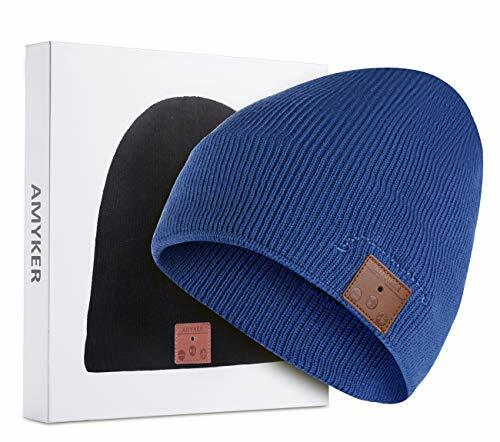 For this, there is a little extra preparation involved but it is definitely worth the trouble. The blueberries and bananas can be stored in a plastic bag or food container. Cut your bread up beforehand and also store them in a food container so that they are not squished during transport. Liquid eggs will travel in your cooler. In order to prep this in the easiest way, Use your food container or plastic bag to hold your liquid eggs and put your sliced bread into the bag. Shake the bag vigorously, then simply add them to your pan. That’s basically it. You can add your fruit and other toppings once your french toast is plated. Add the fruit onto the pan that you use to cook your french toast. Warming them up makes them more delicious and infuses the flavor into the french toast as well. Give it a try! 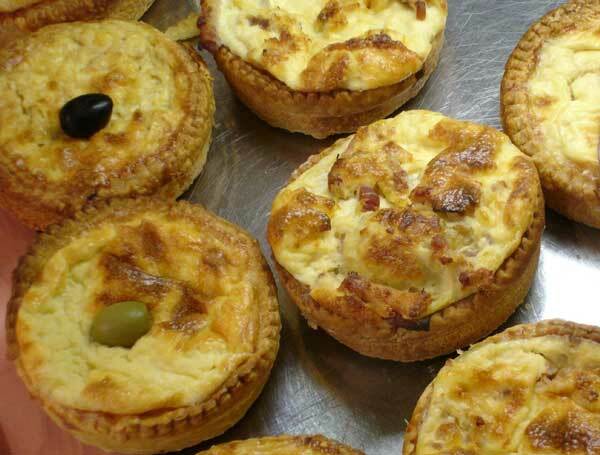 The breakfast quiche sounds like a fancy dish but is pretty simple to prepare. All you do is make a mix of whole eggs (whisked with a fork), heavy cream, peppers, ham, bacon, and cheese. Other meats and vegetables can be added if you like. Don’t forget to season with salt, pepper, and other seasonings you prefer. Make sure any of the extra ingredients you add in are chopped up nicely. Spray a mini muffin tin with nonstick cooking spray and pour the contents about ⅔ of the way full. Cook for 15-20 minutes until the egg mixture is set. Once they are finished, you can store them in a plastic bag or food container. Warm them up over the campfire with a cast iron skillet. The good thing about bringing different types of bread to a camp outing is that it doesn’t require refrigeration and can be used in a variety of ways. Banana bread is even better because it tastes great, can be used for breakfast or a snack, and you can dress it up to make it even tastier. 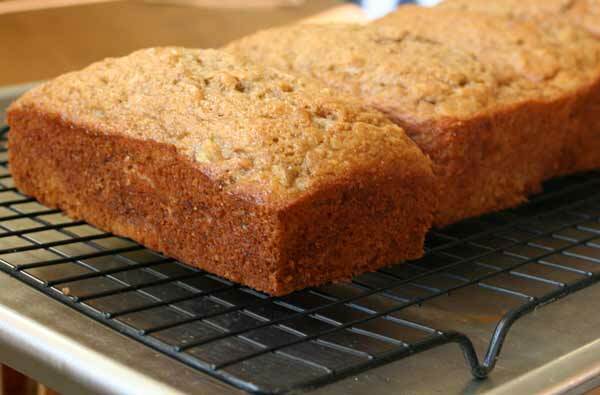 There are a multitude of banana bread recipes and they are usually quite simple. We love adding chocolate chips to the recipe. Also, try warming the bread up while wrapped in foil over the campfire grill or cast iron skillet to make it a warm and gooey treat. 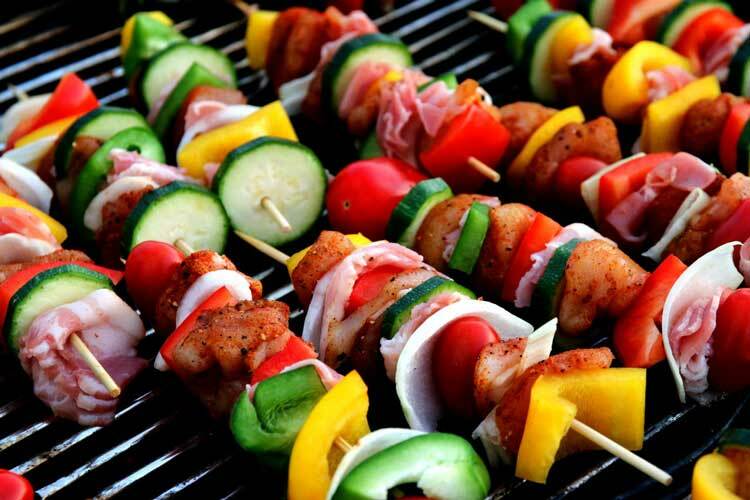 Grab some meat skewers and load them up with cut up meat like steak, chicken, and bacon. Bell peppers and onions are great to add in between the meat to give you a wholesome and balanced meal. 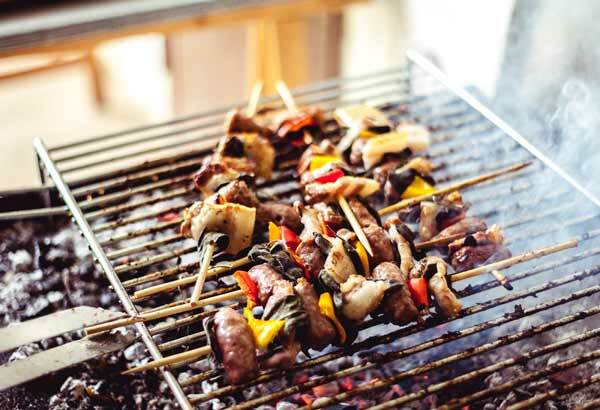 You can cook these beforehand but I think it’s much better to get the skewers ready, wrap them individually in foil, then keep them cold in a container that’s stored in your cooler. If you decide to cook them over the campfire, be sure that your cooler is cold enough to keep your meats from spoiling. Pizza is one of those foods that everyone seems to love and is hard to mess up. All you need is some type of crust, pizza sauce, cheese, and some toppings. While this isn’t exactly a make ahead meal, it is so easy to make on the spot that we had to add it to our list. You can use English muffins or thin-sliced bagels as the crust, then bring along a jar of pizza sauce, packet of shredded cheese, and a small bag of pepperonis. The only ingredient that requires a cooler is the cheese while everything else can be stored with your other foods. 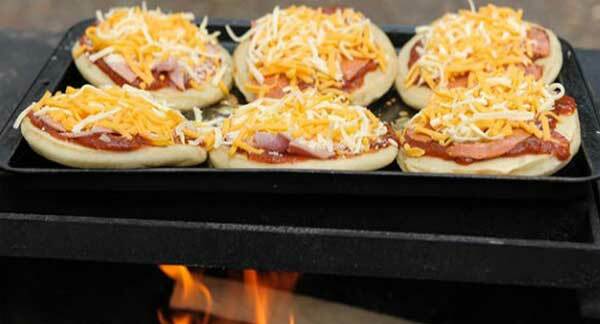 Using a campfire tray or even your cast iron skillet, you just assemble your pizzas and let them warm up over the heat of the campfire. You can also cover the pizzas to help the cheese melt faster and more evenly. You can bring along pizza crust dough in your cooler to make a delicious crust on the spot. Make sure you thoroughly spray the bottom of your pan. You might not have a fancy panini press but grilling a sandwich over a campfire is just as good. Make a sandwich of your choice with your favorite deli meats and cheese and pack them in a plastic zip bag or food container. Using a thick cut bread works best for grilling, or even a soft bun. When you’re ready to start grilling, open the sandwich and add in any condiments and vegetables like lettuce, tomato, onion, or jalapenos. 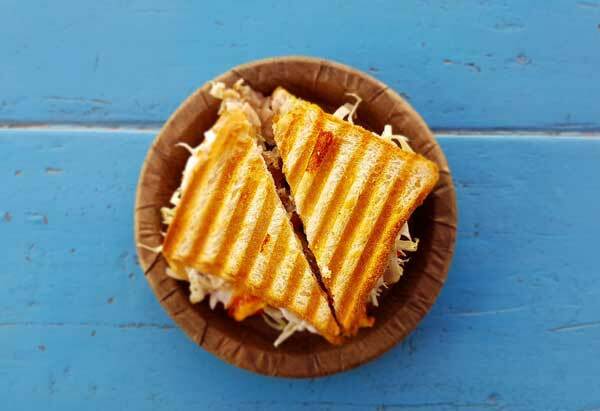 Place your sandwich on the firetop grill or use your cast iron skillet to grill your sandwiches on both sides and enjoy! Use a little bit of butter or oil if grilling your sandwich on a cast iron skillet. This will keep the bread from sticking to the pan and create a deliciously crispy sear. 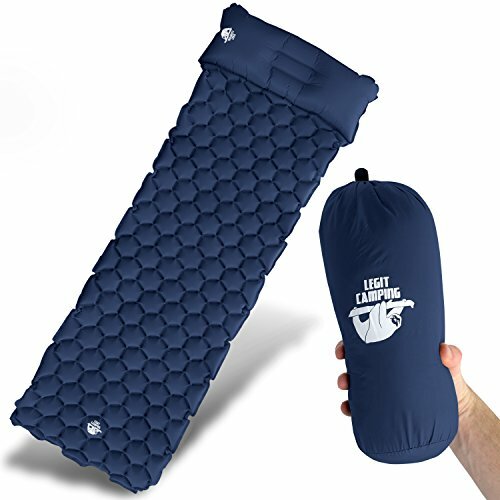 This one is super simple and won’t require any preparation at the campsite. 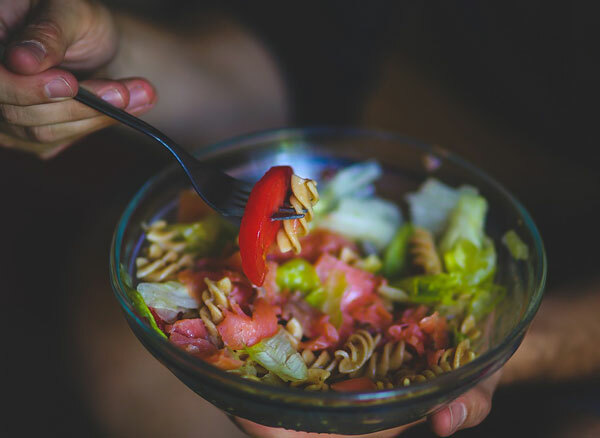 Perfect for a hot summer day of camping, cold pasta salad makes for a great side dish or you can eat it as the main dish for a quick snack. All you do is cook the rotini pasta and place in a large bowl. Combine the rest of the ingredients to your taste. Add a little cayenne pepper, salt, and pepper if you’d like. Cover and refrigerate until ready to serve. Looking for a way to make some seafood on your next camping trip. 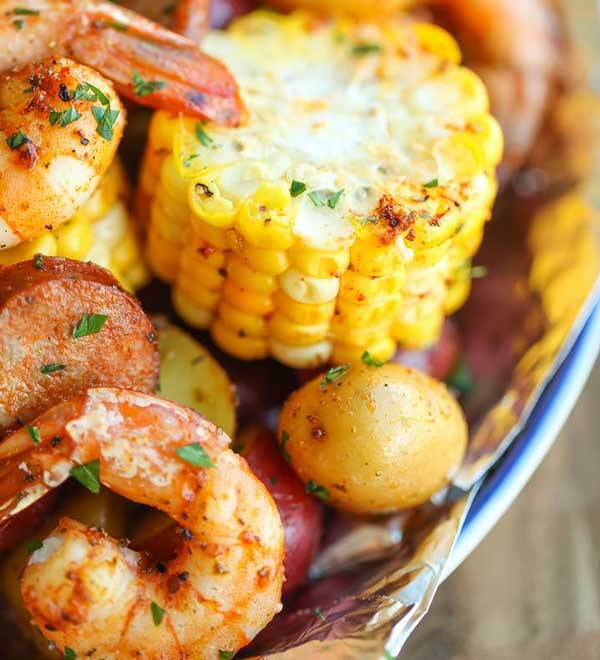 The shrimp boil in foil packets are relatively easy to prepare and even easier to cook. Cut your foil sheets into pieces about 12 inches in length. Repeat 4 times. Each sheet of foil will be a packet. Divide the ingredients equally into each sheet. Do your best to mix the ingredients and keep them in the center of the foil sheet. Fold up the sides of the foil sheets, making sure to seal them. Keep them in a food container and in a cooler or refrigerator until they are ready to cook. When ready to grill, place them with the folded side facing up. You can use a cast iron skillet as well as a firetop grill. We’ve even had success placing them into the fire underneath the logs, similar to how you would bake potatoes in foil. This one is the easiest prep work of all the foods previously mentioned. All you need is the cornbread mix that only requires water. You can make this cornbread over the fire on your cast iron skillet for fresh, hearty cornbread for your next camp outing. 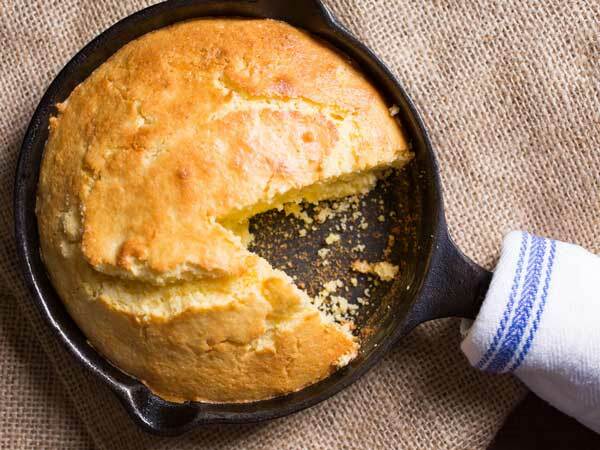 Get the cast iron skillet nice and hot before adding in your cornbread mix. This creates a nice crust around the edge of your cornbread. Have More Ideas on Make Ahead Camping Meals? We’ve found that the ten make ahead camping meals mentioned above were the best and easiest to make, allowing you to spend more time with your family and friends and less time cooking. If you have any more ideas that we may have missed, comment below with your suggestions.